Bike to School Day is Wednesday, May 8th! Rideshare supports schools in SLO County that host Bike to School Day events through sponsorship funds and materials, such as posters/banners, stickers, pencils and more. To get your school signed up to participate and receive free support from Rideshare, fill out and submit the online form here: https://www.surveymonkey.com/r/PCL7NBJ. Encourage active transportation choices at your school with funding from Rideshare. The mission of Rideshare’s Safe Routes to School (SRTS) program is to educate and empower school communities, K–12 students, and parents through tools and incentives that encourage active transportation choices and create change in family/student commuter habits. Any San Luis Obispo County school faculty member, administrator, or parent wishing to build or grow a Safe Routes to School program is welcome to apply for sponsorship funds from Rideshare for SRTS initiatives. Selected applicants will receive support in the form of reimbursable sponsorship dollars, community resources, giveaways, and Rideshare staff support. Additionally, Rideshare will market your school as a Safe Routes to School community member in public relations activities, advertisements, newsletters, and on our website. New program ideas are always welcome! 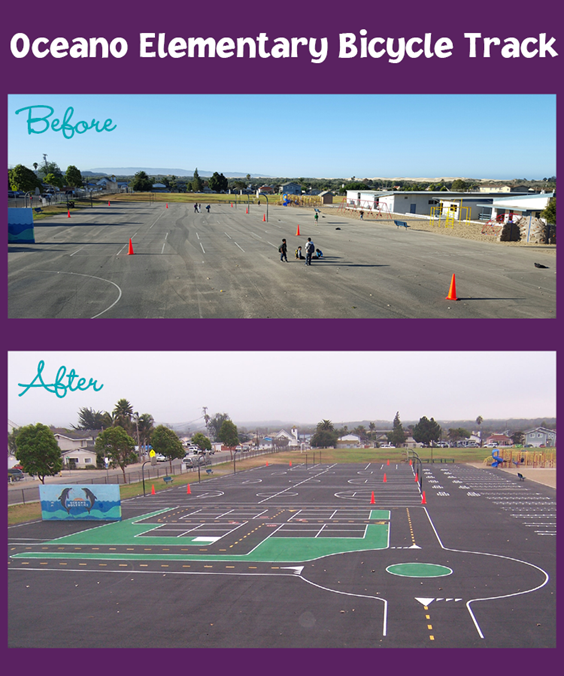 The new bicycle track at Oceano Elementary School is one of California’s first permanent schoolyard bicycle tracks. It was designed to help children practice riding with others by providing an environment for teaching kids proper signaling, yielding, and starting from a full stop. It also has a number of different types of intersections and street signs to create real-life situations. 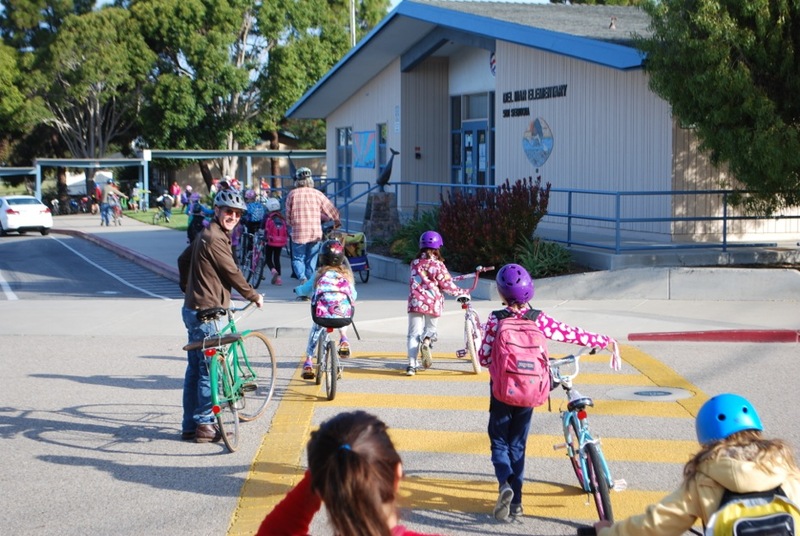 SLOCOG staff was approached by a longtime bicycle advocate, Jim DeCecco, a teacher at Oceano Elementary with the idea of creating a safe place for students to practice using active transportation on the school playground. Staff worked closely with Jim and the school physical education teacher to understand how the playground is used so that it does not distract from the school’s other needs. From these discussions, the circle, kickball bases, and foursquare courts had to be incorporated in the design. Staff made the circle into a roundabout, the foursquare platforms where used to simulate a four-way stop, and the kickball bases were placed into the design. Thanks to the collaboration of school administration and the school district, this project was implemented within three months. SLOCOG’s Safe Routes to School Program is interested in working with additional schools to implement similar concepts. Through Caltrans Active Transportation Grant, Rideshare has the funds to implement cycle tracks at approximately 9 schools throughout the county over the next three years. This application is the first step toward funding a cycle track at your school. The SRTS Task Force provides mini grants to schools interested in starting or maintaining participation in active transportation, offers workshops, and provides incentives for schools to participate in international walk to school and national walk to school day. If you are interested in getting your local school more involved in the SRTS movement, email info@rideshare.org or call 781-4462. In Partnership with Bike SLO County, SLOCOG’s SRTS Program provides elementary schools with 4th or 5th Grade “Driver’s Ed” which is compliant with common core standards and is certified by the California Department of Education. This program is available to all schools and includes two 1.5 hour sessions on two different days. To book an assembly, please contact Bike SLO County. To learn more about SLO County’s Safe Routes to School Program, CLICK HERE. To join our Safe Routes to School Newsletter, CLICK HERE.